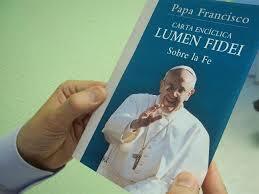 A ninety page encyclical letter, titled Lumen fidei, or “Light of Faith,” by Pope Francis, was released today in Rome. The new text includes outreach to people open to God but who have not yet arrived at the fullness of belief. It says, To the extent that they are sincerely open to love and set out with whatever light they can find, they are already, even without knowing it, on the path leading to faith. Francis also claims a genuine concern for others, even among non-believers, represents a stirring of faith. The document adds, Anyone who sets off on the path of doing good to others is already drawing near to God. Christians should not be arrogant about this. Lumen fidei says instead that, on the contrary, truth leads to humility. Lumen fidei is a heartfelt attempt to speak to anyone searching for God, Martin concluded.